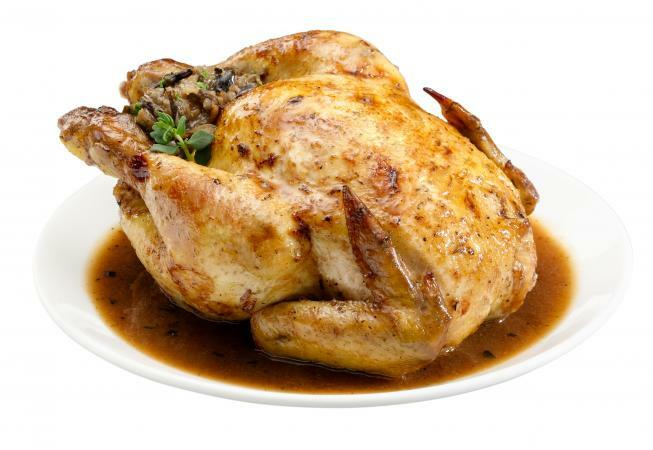 Cornish hens make a lovely main dish for an elegant supper. They roast quickly and offer a flavorful single serving whether you're cooking a romantic dinner for two or making them for a larger dinner party. You often find Cornish hens frozen. You can thaw them in the fridge or quickly in a sink of cool water. Leave the hens in the package and fill the sink with water. Put the packaged hens in the water, and change water about every 30 minutes. It usually takes about two hours to thaw them this way. Before cooking the Cornish hens, remove any giblets and the neck if they are in the cavity of the hen. Rinse them inside and out and pat them dry with a paper towel. Prepare the mushrooms by wiping them with a paper towel or brushing them with a soft-bristled mushroom brush to remove any dirt or debris. Don't rinse them, as putting the mushrooms in water will make them soggy in the stuffing. In a large skillet, heat the olive oil on medium-high until it shimmers. Add the shallots and fennel and cook, stirring occasionally, until soft, about three minutes. Add the mushrooms, salt, pepper, and thyme. Cook, stirring occasionally, until the mushrooms are browned. Add the garlic and cook, stirring constantly, for 30 seconds. Allow the vegetables to cool completely. In a bowl, combine the cooled vegetables with the melted butter, breadcrumbs, and eggs. Mix to combine. Melt the butter and wine on low heat, stirring to combine. Soak four pieces of cheesecloth in the butter and wine. Preheat the oven to 375°F. Place a rack inside a roasting pan. Season the hens with salt and pepper inside and out. Stuff the stuffing into the cavities of the hens. Place the hens breast-side up on the roasting pan rack. Tie the legs together with butcher's twine and tuck the wing tips under the hens. Cover each of the hens with the soaked cheesecloth. Brush additional butter and wine over the top of the cheesecloth. Roast in the preheated oven for 45 minutes. Remove the cheesecloth and brush the hens with the butter and wine mixture again. Continue to roast, uncovered, until the internal temperature of the hens is 180°F and the stuffing reaches 165°F, 15 to 30 minutes more. Omit the butter, wine, and cheesecloth. Instead, cover the hens with foil for the first 20 minutes, and then remove the foil for the remainder of the baking time. Instead of stuffing the hens with mushroom stuffing, you can flavor them from the inside by adding 1/4 of a quartered onion, a few garlic cloves, and a sprig of thyme or rosemary before roasting. Add a pound of quartered mushrooms tossed with 2 tablespoons of melted butter and seasoned with salt and pepper to the pan underneath the rack instead of making the stuffing. This will allow the mushrooms to roast as the hen cooks. Cooking time will likely reduce by about 20 minutes for an unstuffed hen. Remove the thyme, onion, and garlic and discard before serving. Serve with the roasted mushrooms on the side and mix up a crockpot stuffing that can cook all day. Cornish hens are easy and elegant. They're also delicious. Have them with a simple side, such as roasted brussels sprouts for a tasty meal.